The multibillion-dollar global construction industry is where ideas and drawings take birth on the architect's table. Outsource2india introduces high-quality drafting expertise to transpose these ideas to reality by providing accurate construction drawings with the very level of specificity required by construction documents. As localized talent becomes tough to source and expensive to retain, many organizations turn to construction and GA drawings outsourcing company like Outsource2india as their service partner for creating detailed construction drawings. It can enable firms to analyze, plan, and execute GA drawings with precision. With an industry experience of over 20 years, Outsource2india has drafted construction drawings for various types of construction projects such as commercial buildings, residential buildings, and even renovation of old structures with a turnaround time of 24 hours. The team at O2I specializes in preparing 2D construction drawings, construction documentation, BIM (Building Information Model) services, structural and steel drawings, etc. which make us the perfect partner for all your construction drawing requirements. At Outsource2india, we have a highly skilled engineering team with the expertise in using software such as AutoCAD and Revit to create accurate construction drawings in a cost-effective manner. When you outsource construction drawing services, we create CAD drawings including section drawings, elevation details, site plan details, as well as presentation drawings to aide our growing list of clients from the real estate and construction industry. Steel construction detail drawings - Draft drawings that provide all construction details to erect a steel structure and include in-depth details such as bolt and nut details, riveting, welding, etc. We also provide General Arrangement Drawings that are a part of construction drawings and include floor plans, sections, elevations, MEP and HVAC, and flooring layout. To find out how we helped a US based contractor with high-quality floor plan modifications using redline markups, read this case study. We also specialize in clash detection services that help in effective identification, inspection and reporting of interferences in a project model as electrical, MEP, and structural. Why Choose Outsource2india's Construction Drawing Services? Experienced Team - The engineering team at O2I comes with an average experience of 5 plus years in their respective fields and are adept at handling large volume work without any compromise in quality. Our skilled team includes qualified and experienced civil engineers, structural engineers, and architects who provide accurate and high-quality construction drawings. Swift Turnaround - Our strategic global locations and multiple delivery centers enable us to deliver any project irrespective of size and scale within a suitably short time. High-quality Services - We have a thorough understanding of international drafting standards and adhere to global quality standards. We adhere to the quality guidelines mentioned in the SLA (Service-Level Agreement) so that we can meet the client's quality benchmark. The Quality Assessment (QA) team performs multiple checks to ensure accuracy. Latest Software - Our team utilizes licensed software for legal compliance. We use the latest versions of AutoCAD and Revit that enables our team to draft accurate and error-free construction drawings. Cost Effective Services - We analyze and understand the nature of your project and offer services based on your requirement. We have a flexible pricing structure with per hour, per design, and full-time equivalents (FTE) options to suit your budget. Data Security - We give high priority to data security and ensure that only authorized personnel have access to your files. We use FTP or VPN for secure file transfer and maintain the backup of all source files and completed files for easy retrieval in case of data loss. 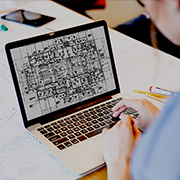 A leading Italian architectural firm was looking for a reliable partner who could provide them with accurate construction drawings for a London-based apartment complex. Our team of civil engineers provided the services in no time. A leading US-based property management firm wanted the civil engineering team of Outsource2india to handle their construction drawings. We provided the services within no time. Outsource GA drawing services to O2I, a 19-year-old civil engineering services outsourcing company based out of India which offers well-planned GA drawings developed by smartest engineers in the industry. Our expertise in engineering drawings using the latest software housed at our delivery centers can bring you the peace of mind while we streamline collaboration and output. When you outsource construction and GA drawings requirement to O2I, you gain a partner who not only provides reliable services at affordable prices but also serve you with better service experience. Get in touch with us today and enable your corporation to experience the benefits of high quality and low-cost GA drawings.